With the exception of meat, fish and a few types of seafood, almost all foods have some amount of carbohydrate. If you suspect that carbs are giving you a headache, it could be a sign that your blood sugar is high. Or if you have food allergies or celiac disease, carb-containing foods can be the trigger of your headaches. While headaches are also sometimes linked to dehydration, occasionally an underlying medical issue is to blame -- not your diet. It's always best to see your doctor to get to the root of the problem. Your cells run on fuel called glucose, which is one of the smallest types of carbohydrate. If you're normally healthy, your body should stabilize your blood sugar, or blood glucose, on its own. However, if you're a diabetic or prediabetic, or you have other health issues, your blood sugar could get too high after eating a meal containing carbs. When this happens, the nerves in your brain and eyes can become damaged, leading to painful headaches. If your blood sugar is high, you'll also probably feel shaky, be disoriented, have blurred vision and urinate a lot. Aside from headaches after consuming carbohydrates, be aware of rashes, difficulty breathing, a hard time swallowing or wheezing. These are signs that you could be having an allergic reaction and need to seek immediate medical treatment. Because it can be difficult to narrow down a food allergy and it's possible to be allergic to anything, keep a detailed record of the foods you eat and any related headaches. For instance, artificial sweeteners, which contain trace amounts of carbohydrates, trigger headaches for some people. Onions, milk, bananas, nuts and peanut butter are some of the other carb-rich foods that often cause allergic reactions. Over time, you might start to see patterns with which foods give you headaches. Then you can visit an allergist to get tested for specific food allergies. Regular headaches after eating could be a side effect of celiac disease, a disorder characterized by gluten malabsorption. While gluten is a protein, not a type of carbohydrate, it is found in carb-rich foods like breads, pastas and baked goods. When you have celiac, your body doesn't recognize gluten as a safe substance and your immune system goes into attack mode. This causes your body to destroy healthy cells in your intestinal tract. If left undiagnosed, celiac can cause long-term problems with malnutrition since nutrients can't be absorbed through damaged intestinal walls. 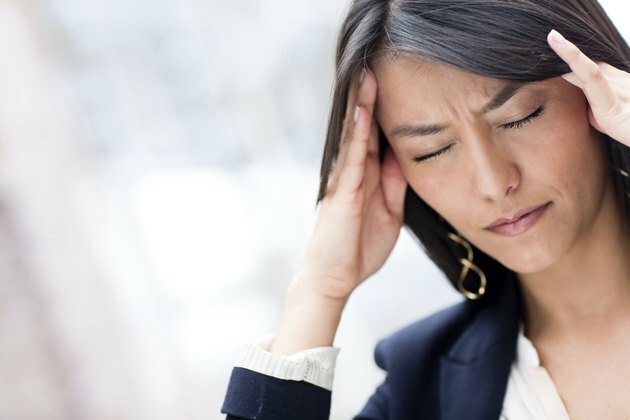 Often headaches and other discomfort associated with celiac, including diarrhea and bellyaches, will go away if you stop eating foods containing gluten -- if you have diagnosed celiac disease. If you scarf down a big high-carb meal and have very little to drink, your headaches could simply be a sign of dehydration and have nothing to do with your actual carbohydrate intake. Dehydration also leaves you a little lightheaded, fatigued and, of course, thirsty. Men should have 3.7 liters of fluid -- from all sources -- each day. This amounts to about 125 ounces. If you are female, have 2.7 liters or 91 ounces per day, the Food and Nutrition Board of the Institute of Medicine recommends. While all drinks, and even foods, count toward your fluid intake goal, water can absorb directly into cells. This could help nix that headache as quickly as possible. Diabetes Self-Management: High Blood Glucose: What's Behind the Symptoms?